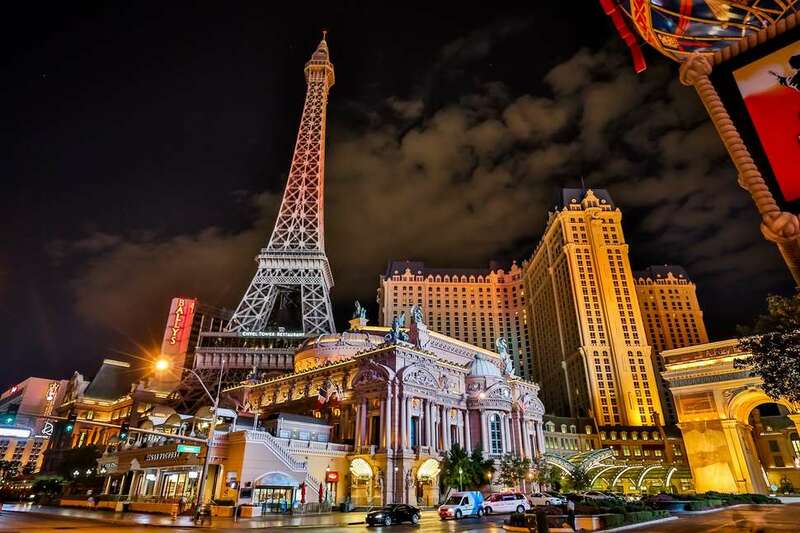 You may not know it, but Las Vegas is one of the creepiest cities in the entire country -- and no, we're not talking about that drunk dude hitting on every woman at the bar. There are plenty of places in and around town where the dead (and undead) still roam. Get ready to put a genuine fright into your souls when you're not attending this season's slate of Halloween events in Vegas. The worst fire in Nevada history tore through the old MGM Grand hotel back in 1980. It killed 87 people -- mostly due to smoke inhalation -- while helicopters rescued survivors from the roof. 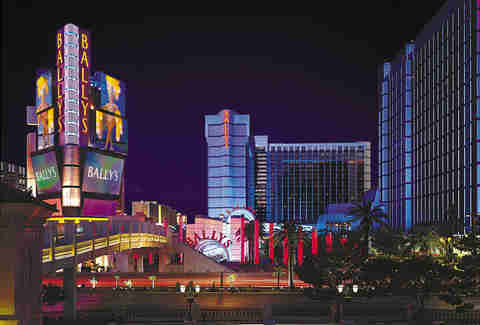 The property was eventually sold and renamed Bally's (while a new version of the MGM Grand reopened down the street). The tower where the fire took place is still part of the hotel, and guests sometimes claim to see unusual shadows in hallways, hear strange noises, and notice furniture that mysteriously moves in the rooms -- especially on the higher floors that were most affected by the fire. Many believe it's due to the spirits of those who didn't survive the tragedy. This is where rapper Tupac Shakur was famously gunned down in Las Vegas back in 1996. It happened while he was in a car driven by music mogul Suge Knight; they were traveling away from the Strip on Flamingo and stopped at a red light on Koval when gunfire erupted from a car that pulled up on the right-hand side. Shakur died in the hospital six days later. It's a pivotal moment in music history, and the identity of the shooter is a mystery that remains unsolved to this day. Some fans believe Shakur's ghost still haunts the intersection -- and there have been sightings of a person in a bandana who looks just like the late star… maybe that explains why his estate has been able to release more music after his death than when he was alive. 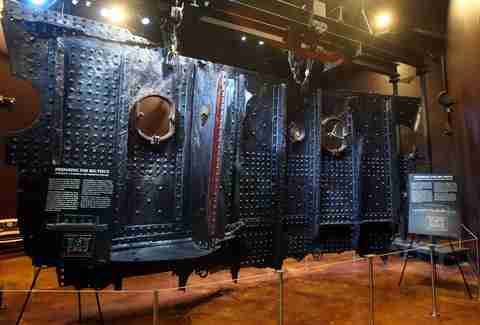 It may seem like just another tourist attraction, but the Titanic exhibit at the Luxor is actually something special. In addition to artifacts from the wreckage, there’s also "the big piece" that's actually taken from the side of the sunken ship. Talk to the employees: they swear deceased passengers haunt the exhibit, appearing, disappearing, closing doors, and making their presence felt in rooms modeled after the same ones on the Titanic itself. The Luxor is a perfect spot for it; the Egyptian-themed resort used to feature ancient relics in the lobby that often brought their own dose of supernatural energy. The town of Rhyolite is a spooky place. It's not even really a town anymore, having been abandoned when the mining boom went bust back in 1907. Wander around and you'll see the scattered remains of a bank, jail, and train depot. It looks more like a nuclear war zone than a ghost town -- but just as sinister -- and perhaps still home to the spirits who once lived there many years ago, when they were still alive. 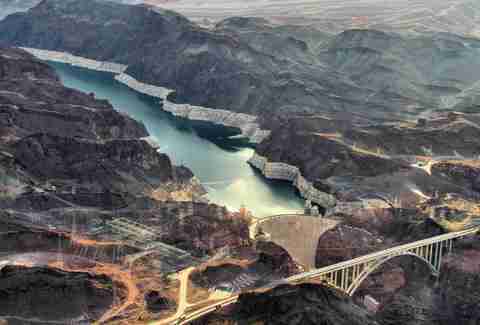 Back in January 2014, a woman was accidentally photographed by a bystander at the Hoover Dam bypass bridge. Moments later, she was gone after jumping off the side. She had taken a taxi from Tempe, Arizona to reach the landmark, which has seen its share of fatal jumps over the years -- much like the Golden Gate in San Francisco and George Washington Bridge in New York. There were also 112 workers killed in the construction of the dam between 1931 and 1936. Their spirits could be struggling to find peace in the afterlife, roaming the hills and caverns that surround the Hoover Dam. Las Vegas was a hotbed of criminal activity when mobsters ran the casinos -- and pretty much the entire city. 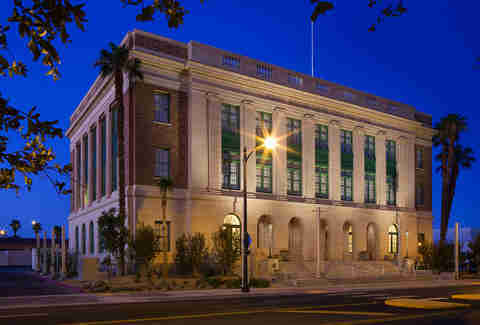 Their exploits are documented at the Mob Museum Downtown, which was renovated from the old courthouse, where many of these characters were prosecuted. As you can imagine, they weren't too happy about their jail sentences, and some say their spirits roam the halls after hours. Independent of any of that though, this is one of best museums and generally one of the best things to do in Vegas if you're visiting. 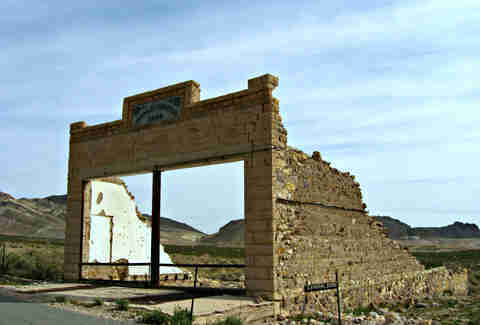 About 185 miles north of Las Vegas sits the small town of Goldfield, which is said to be the most haunted ghost town in Nevada. There's actually a piece of it -- a small house -- that was relocated to the Clark County Heritage Museum in Henderson. It was an antique store, and is now one of 20 restored buildings on the property. 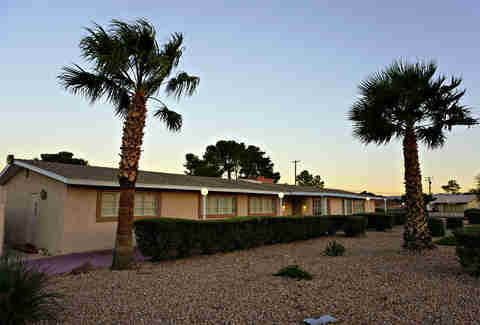 Another one is the Beckley House, which was originally in Downtown Las Vegas on 4th St. Some claim they've seen the image of a young girl roaming the home. However, curator Mark Hall-Patton says "There's no child who ever died there. There's no child who died next door to there, or under there, or on top of there." Is he telling the truth? Pay a visit and decide for yourself. As you approach the state line to California, you'll come across Whiskey Pete's, a hotel and casino built back in the '70s. 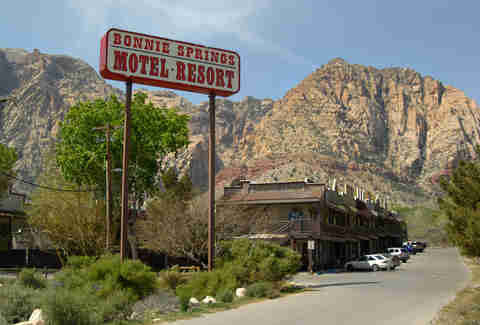 The place is said to be haunted by Whiskey Pete himself, a gas station owner who liked to dabble in moonshine on the side. According to legend, his grave was accidentally dug up by workers when building the resort -- and relocated off the property. But that doesn't mean his ghost doesn't still linger around from time to time. If that wasn't enough, the bullet-riddled car in which Bonnie & Clyde were famously killed sits in the lobby, along with Clyde's bloody shirt. People report some serious spookiness and negative energy while standing near the exhibit. Is there anything creepier than the sound of a chain rattling after dark? 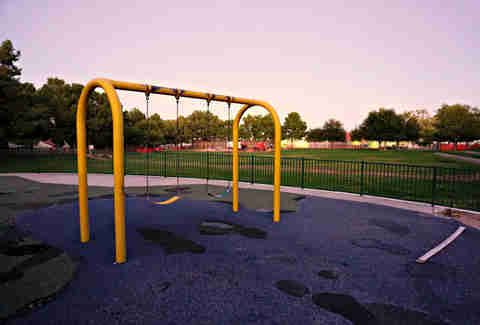 According to local urban legend, a swing set at Fox Ridge Park is said to be haunted by the spirit of a young boy who was hit and killed by a car while playing in the street nearby. Some people who have visited the park say they feel a disturbing energy when hearing the sound of the swing rattle in the wind. Others report seeing the image of the young boy quickly appear then vanish or -- if you believe the kids at the elementary school next door -- turn into a demon. 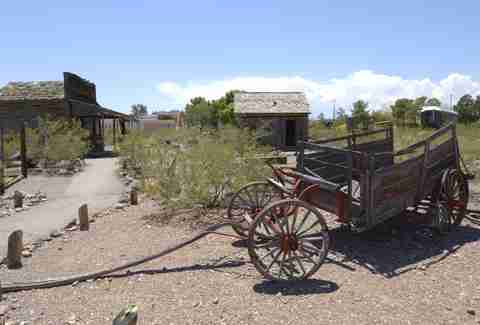 This Old West town was built back in the mid-1800s, and used as a wagon stop on the Old Spanish Trail that led to California. It features an antique-style motel -- and yes, you can book an actual room -- and a replica of a Nevada mining town that includes an opera house and wax museum. Both are said to be prime locations for unexplained paranormal activity. You may feel a chill (or something touch you) when walking around inside; according to legend, the land was used as a graveyard for those traveling across the country. It was also originally claimed by the Paiute Indian tribe, long before the town was founded. The community has embraced its bone-chilling reputation by staging Bonnie Screams -- an annual haunted celebration that takes places around Halloween each year. Bugsy Siegel wasn't only one of the most notorious mobsters in history, he was also the driving force behind the opening of the Flamingo hotel and casino. After investors complained about the property's profits -- or lack thereof -- Siegel was shot dead in Beverly Hills. 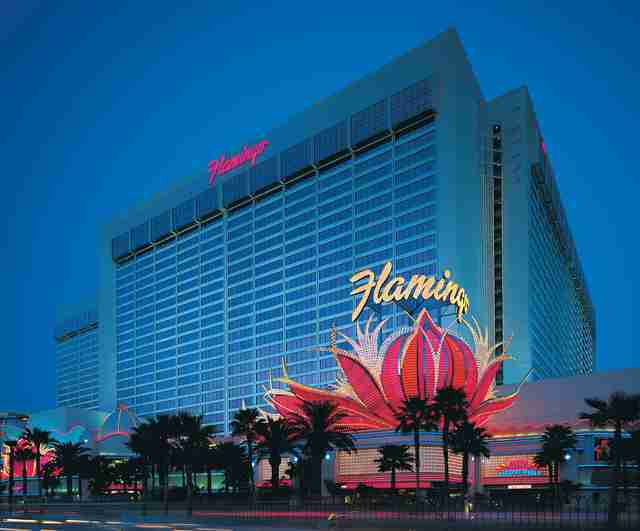 His ghost, however, is said to have returned to Las Vegas, roaming the Flamingo, especially near an outdoor memorial dedicated to him and the suite that was once his residence. He had it built like a fortress, with an escape ladder that led to an underground garage and getaway car. 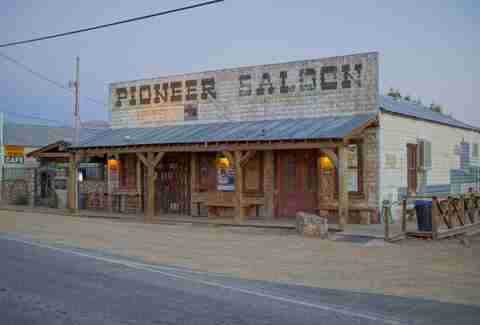 Having been around for more than a century, the Pioneer Saloon is the oldest bar still open in Southern Nevada. It's also where Clark Gable famously hung around, waiting on the fate of his wife Carole Lombard, who was killed in a plane crash at Potosi Mountain in 1942. Much of the memorabilia at the Pioneer Saloon is dedicated to her memory -- and her spirit -- which according to patrons can be felt from time to time. The place is also said to be haunted by the ghosts of an old miner, and a man who was shot and killed. You can sign up for a Haunted Lockdown and investigate for yourself. 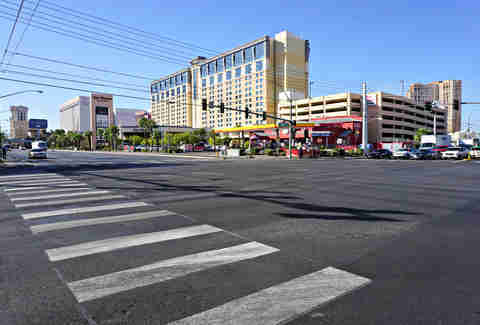 There's an area of Las Vegas Blvd where the borders begin to blur between the Strip and Downtown. 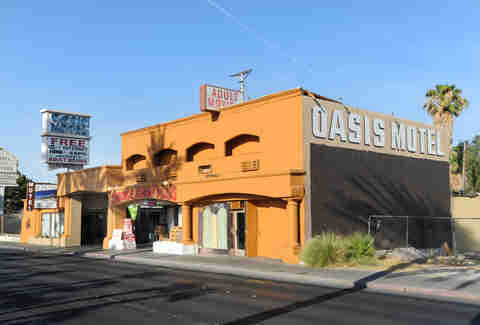 That's where you'll find the Oasis Motel -- buried within a wave of pawn shops, bail-bond services, and wedding chapels. Although it was shut down for prostitution at one point, there's nothing special about it... except that people tend to check in, then kill themselves. World-famous poker champion Stu Ungar and actor David Strickland (from the NBC sitcom Suddenly Susan) were found dead after hanging themselves. Both checked into Room 20, and both are said to still haunt the place. So if you're looking for a cheap motel, you may want to avoid that particular unit -- unless you have a morbid fascination with death. The Oasis Motel is actually just across the street from another famous suicide spot, the Stratosphere tower, where people are known to jump from the top. After wrapping up an 11-year run on Sanford and Son, Redd Foxx continued his career in stand-up comedy as a big draw in Las Vegas. He moved to Sin City, where he built a reputation for enjoying the gambling culture just a little too much; by the time he died in 1991, most of his earnings were claimed by the IRS, and his funeral was paid for by Eddie Murphy. Foxx promised to stick around after his death, and his home near Eastern and Hacienda is said to be haunted by numerous owners who have taken custody of the property over the years. It's currently an office for Shannon Day Realty. Look carefully at the sign out front -- there a picture of a red fox in the corner as a tribute to the late comedian. The gesture may have gotten on his good side, as reports of hauntings have dropped in recent years. 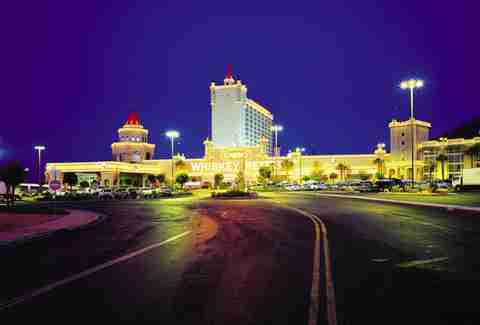 Rob Kachelriess has been writing about Las Vegas for Thrillist for more than five years. He likes treats more than tricks. Follow him on Twitter @rkachelriess.